Tri-Star (AIM: TSTR), the mining and minerals processing company, is pleased to announce that management at Strategic & Precious Metals Processing LLC (“SPMP”) in Oman, which Tri-Star has a 40% shareholding, expects the initial production of pure antimony metal to take place in the next week. The event is a key milestone for SPMP as it proves all aspects of this technologically advanced facility are functional and the country of Oman can boast a world-class, strategic industrial asset. The production of first metal is also a key requirement in obtaining a long-term finance package for the plant and the board of Tri-Star understands that SPMP is well advanced in these discussions. As was recently announced, SPMP has requested an additional US$10.5m from its shareholders. The Company is confident that an equity placing will not be required in order to meet its 40% share of the funding requirement. In addition, the disposal of the Company’s interest in the Göynük mine in Turkey has completed for a total cash consideration of US$500,000, with the first tranche of US$200,000 already received by Tri-Star. Tri-Star is facilitating an offtake contract between the Purchaser and SPMP. “We are pleased that first metal is now imminent. 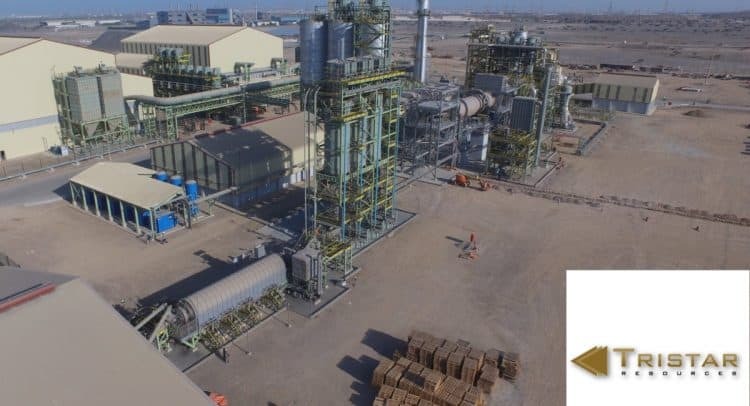 The SPMP Plant is a key strategic asset for Oman with very strong backing from the country’s Government – who have shown exceptional support for the Project. The success of the Project demonstrates the potential that can be realised through Foreign Direct Investment in Oman by international partners, particularly the UK, with whom the country enjoys a special relationship.